If you consider yourself an audiophile, then you probably already know that most computer speakers don’t give you the best sound. Now, if you’re a mixing or mastering engineer and need to have low quality speakers on hand, then that’s not much of a problem. But even then, it’s nice to have a good, reliable pair of speakers at your disposal, especially if you love listening to music. And, if you’re willing to put a bit of money down, you can get a good pair of computer speakers. Here are seven of the best audiophile computer speakers for music playback. What Should I Look For In Audiophile Computer Speakers? How Much Should I Spend On Audiophile Computer Speakers? The Audioengine A5+ speakers come with built-in power amplifiers with 50 watt per channel RMS, custom Kevlar woofers and silk tweeters, improved thermal management and remote control. They come in Black, White or Bamboo, and are compatible with Macs and PCs. Features aside, these are probably the best sounding speakers in the price range. All the frequencies sound clear, with no muddiness. If there’s one frequency that could be better, it would be bass, as the low end is slightly lacking. But that’s only if you need more bass, as the A5+ speakers do have plenty of it. One more important consideration is desk space. These speakers take up a lot of room, so it’s best to ensure that your desk can accommodate them. Whether it’s the A2+ or A5+ speakers, Audioengine is worth a look. The Logitech Z906 speakers come with 5.1 digital surround sound, are THX-certified home theater speakers, deliver 500 watts of power, gives you the ability to connect to up to six devices, comes with a wireless remote, and it works with any device that has a 3.5mm headphone jack, RCA, six-channel direct, digital coaxial input or optical inputs. 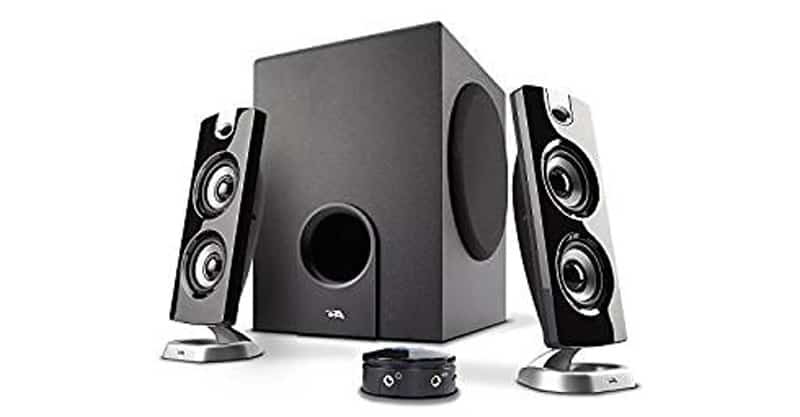 There’s a good chance you won’t find a better 5.1 surround speaker system at this price point. The center console is stackable, and offers controls for input selection, stereo mode and volume control of other speakers. The speakers sound great but shine the brightest when in 5.1 (2.1 and 4.1 modes are also available). These are great speakers across the frequency spectrum. There are a few downsides, of course. One is that you would need a big room to truly take advantage of 5.1 surround. Setup can also be cumbersome, with a lot of cables to attach. 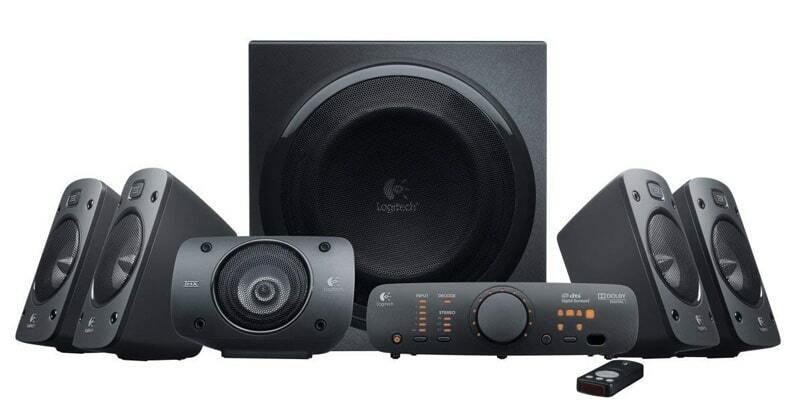 Aside from that, if you love surround sound, you’ll love these Logitech speakers. 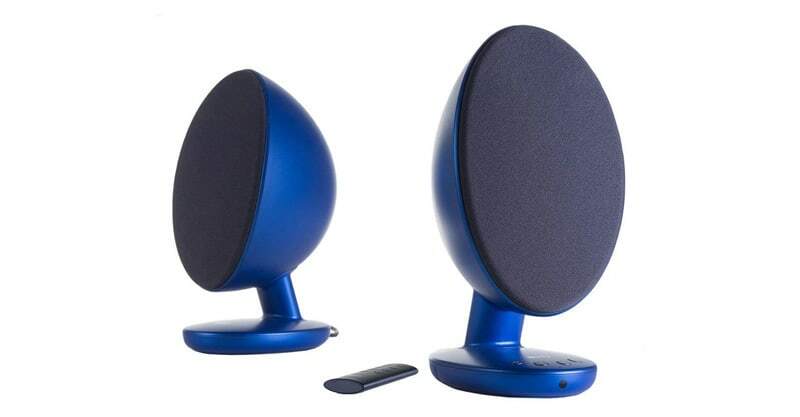 The KEF EGG is available in Frosted Blue, Gloss Black and Pure White. It connects via USB, auxiliary input or Bluetooth. 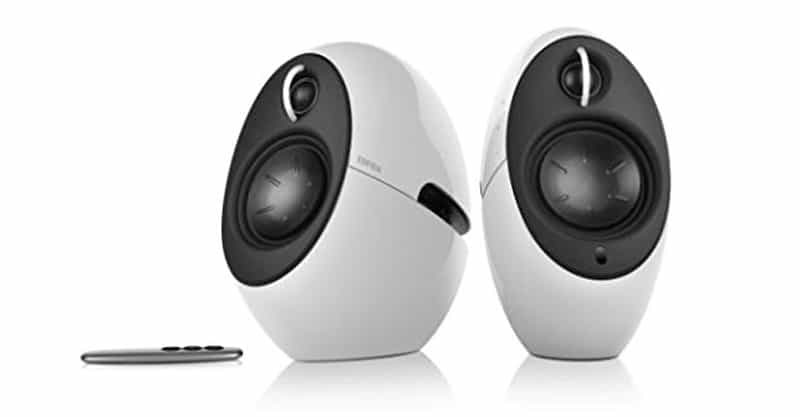 These powered speakers have an integrated amplifier and DAC, use KEF’s Uni-Q driver array, which combines the tweeter and mid-range driver, comes with a remote control, and features an output for an external subwoofer. This is a quality pair of speakers with excellent build, and setup is a cinch. Its overall sound is both detailed and warm, though without a subwoofer, at high volumes, you’ll notice the lack of bass. Now, these aren’t the best sounding speakers. But they are solid and robust with great esthetics. So, whether to go with these speakers is probably going to come down to features and preferences. Still, I wouldn’t ignore these KEF speakers. 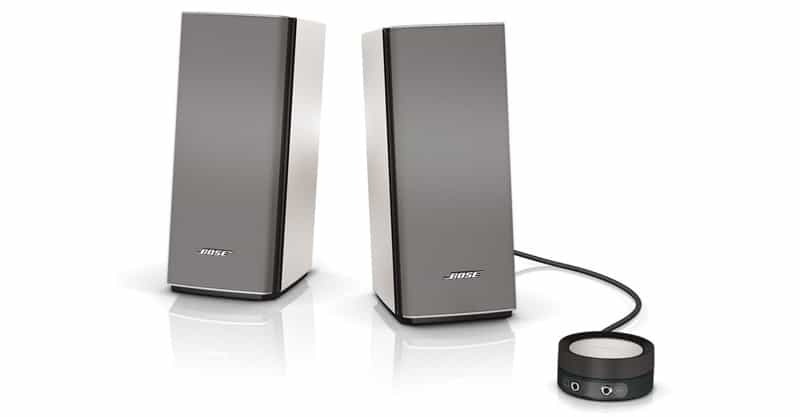 The Bose Companion 20 speakers come with a control pod to adjust or mute volume, connect headphones and add other audio devices. These are spatially efficient, and boast a full, natural sound thanks to Bose TrueSpace technology. If you know anything about Bose, you know that they produce great speakers. The sound spectrum is surprisingly wide. Now, you should be aware that these speakers don’t come with a bass module or wireless connectivity. But if that doesn’t pose much of an issue for you, I have no doubt you’ll get a kick out of these. Whether it’s these Bose speakers or another product, if you’re looking for a great pair of speakers, you simply can’t ignore them. These Edifier USA e25 speakers come with a wireless remote for volume and power, boast Bluetooth pairing capability with Bluetooth enabled devices, come with touch sensitive control, an auxiliary input for connecting to external devices, DSP and DRC for enhanced audio performance and distortion control, and a three-inch bass driver. They also come in Black, Red and White. These are great looking speakers that are also spatially efficient. They come with cables for all outputs, which is a true rarity. These speakers have more low end than you’d expect, but are nevertheless clear sounding. These are excellent speakers for what they are. The only downside is that they have exposed tweeters. Not a big deal if you take good care of them. This Edifier USA pair should certainly go on your shopping list. 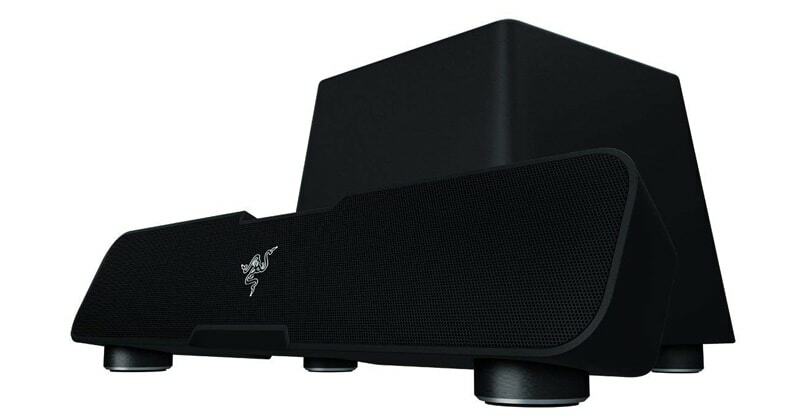 The Razer Leviathan surround sound bar comes with Dolby technology, a dedicated 5.25” downward firing subwoofer, aptX Bluetooth technology and NFC technology for fast pairing. The sound bar is a step above 2.0 and 2.1 options, and it sounds great. It will never sound as good as true 5.1, as it’s comprised entirely of two pieces – a sound bar and a subwoofer. But for what it is, it sounds surprisingly good. The main downside is there’s just too much bass. If you’re a gamer, you might enjoy that. But if your main intent is to listen to music, then you may not enjoy the added bass all that much. It all depends on what you like, but you might consider giving the Razer speakers a go. Now for a good budget option to round out the list. The CA-3602FFP system is driven by an acoustically optimized internal power supply, the control pod gives you easy control over the sound system, the 5.25” subwoofer gives you deep bass, it’s created to look great next to your other computer hardware, and it includes a one-year manufacturer warranty. These are a good choice if you’re looking for an upgrade over your current speakers. You probably won’t find better sounding speakers in the price range. The overall sound is not half bad, but you will notice bass begin to distort at higher volume levels. These are decent speakers with good features at an affordable price point, it’s as simple as that. If you’re looking to save money, the Cyber Acoustics speakers might be just right for you. 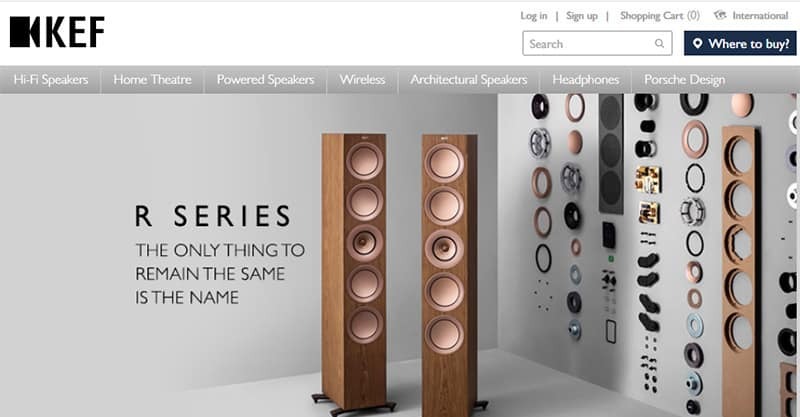 When it comes right down to it, there are so many speakers to choose from, making it hard to embrace just one pair. Your budget will certainly play a part, and it could make the choice a little easier depending on what price range you’ve settled on. Aside from that, there are so many brands and models, and they all offer something a little different, especially in terms of looks, durability and features. 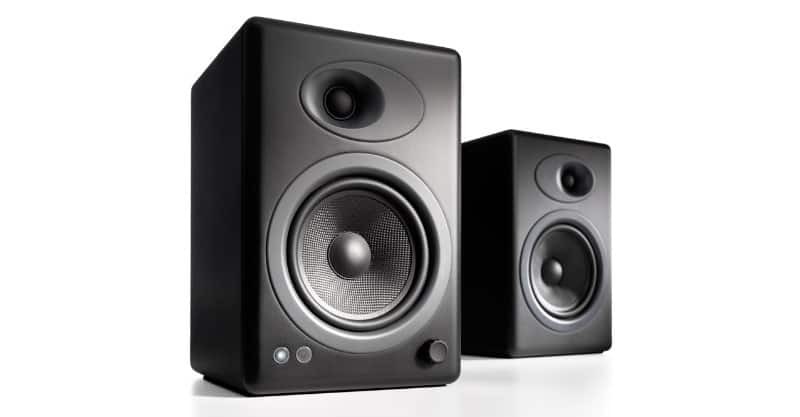 You’re an audiophile, so the number one thing to seek out in a pair of speakers (or multiple speakers) is great sound. I would set forward that it’s also important to balance this decision with your budget, as you can easily spend $1,000 or more depending on what speakers you’re looking at (i.e. The Feniks Essence, which are amazing speakers, but are quite costly). But I’m guessing you love clear and crisp highs, mids and lows with no muddiness or screechiness and just the right amount of bass. Am I right? Well, unfortunately there’s no way of knowing how a pair of speakers sound without testing out the speakers for yourself. So, if you’re undecided, it might be worth visiting the local electronics store and trying out a few products before deciding. As for surround sound, I think that’s a take it or leave it situation. In general, it’s best to have a bigger room for using 5.1 systems, and that’s something you should keep in mind if you’re thinking about going surround. It’s a sad day when you pay good money for a pair of speakers and they crap out on you. Look, you can get a good pair of speakers these days in the $80 to $120 range, and that’s saying a lot. But if you spent more than that, and the speakers couldn’t stand up to a little abuse (and I do mean a little), you’re probably going to be disappointed with your purchase. As I always say, your best strategy here is to check online reviews for red flags. 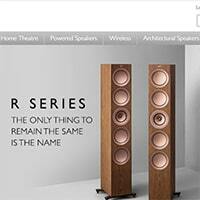 If you discover that the speakers you’re thinking about buying are flimsy, it might be worth looking elsewhere. If nothing else, you’ll get a sense of what to look out for if you end up buying them. It’s always good to be careful with your gear. Do you want a wireless remote? Bluetooth connectivity? The ability to plug in a subwoofer? A unique and special color for the exterior? Some audiophiles want more in a pair of speakers. Others embrace simplicity. It doesn’t matter which direction you choose. What’s key is that you end up with speakers that are compatible with your current gear and come with all the features you want/need. There are other minor considerations to think about when it comes to speakers, but I think features is up there with sound and durability in terms of importance. The desk and room space you have available is going to vary from person to person. If you have less, then buying a bulky system may not be the best idea. If you have more, you might consider going with a surround sound system. It’s not important that the speakers be a certain size. What matters is that you can dedicate the right amount of space to them. When it comes to speakers, you get almost exactly what you pay for. Arguably, there are few overpriced options, and some of the cheapest speakers in the category are surprisingly good for the price. But it can be hard to find exactly what you’re looking for unless you’re willing to put in some money. So, if you spend less, you’re probably going to be sacrificing build quality and sound. If you spend more, the speakers should sound better and be more durable. Ultimately, there isn’t a right amount of money to spend on your speakers. You should consider what your budget is, and then find speakers that sit in a comfortable price range. I think this mostly comes down to how you use your computer. Some people use their computer for general administration and communication purposes. Others use it for gaming, movies, listening to music and entertainment. Of course, there are the content creators, audio engineers and video editors that spend countless hours on their computer. If you tend to use your computer for a lot of things, then you might enjoy the flexibility of having surround sound, particularly if you tend to use it for entertainment purposes a lot. If you’re planning to mix, master and/or edit audio, then having at least a subwoofer is a good idea. 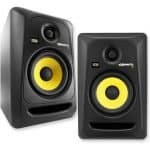 You should still have a good set of studio monitors at your disposal, but your computer speakers can certainly serve as another valuable reference point. To me, surround sound matters most when you’re watching movies or you’re gaming. So, if you aren’t planning to engage in those activities, surround sound probably won’t matter a whole lot to you. So, there you have it. Surround sound isn’t critical, but depending on how you use your computer, you may enjoy having it. You can spend a lot of money on a pair of speakers. 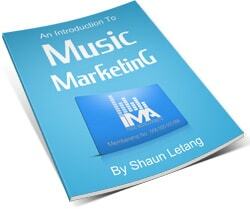 If you love listening to music, the value is certainly there. But if you’re planning to become an audio engineer, then I would prioritize buying a pair of good studio monitors first. 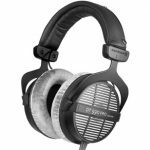 These will probably end up being your go-to speakers as you’re editing, mixing and/or mastering.